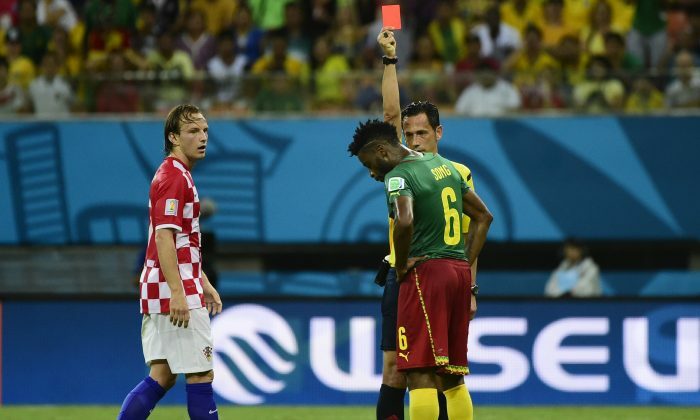 Cameroon defender Alex Song has been banned for his nation’s next three official games. The 26-year-old midfielder elbowed Croatia striker Mario Mandzukic in the back during Cameroon’s 4-0 lost to Croatia last Wednesday, and received a straight red card. The red card already means that Song will automatically miss the game against Brazil. Song will have to sit out Cameroon’s next two official matches before his ban is lifted. FIFA’s disciplinary committee also added a 20,000 Swiss francs ($22,300) fine to Song’s ban. Here is an Associated Press article on Cameroon’s match against Brazil. TERESOPOLIS, Brazil (AP) — Brazil faces what should be a relatively simple task to advance past the group stage at its home World Cup — draw or beat a Cameroon team that is playing its last match before flying home. But in a tournament already full of surprises, Brazilian players are wary ahead of Monday’s game in Brasilia. They believe that playing a team with nothing to lose is certainly going to prove more difficult than most people expect. Brazil leads Group A with four points from two games ahead of the decisive matches of the pool phase. Mexico also has four points, but it trails on goal difference. Croatia, which plays Mexico in Recife on Monday, has three. For the hosts, the permutations range from winning the group to a shock exit, depending on results. Elimination at this stage would be unthinkable for Brazil, a team widely considered as a tournament favorite to win the title. Along with the benefit of home support, Brazil came into the finals boosted by a triumph in last year’s warm-up event, the Confederations Cup, as well as victories in 15 of its last 16 matches. But after early exits by defending world champion Spain and England, as well as surprises by teams such as Costa Rica, which has beaten Uruguay and Italy, Brazilians know better than to take things for granted. Cameroon began the tournament with a 1-0 loss to Mexico and a 4-0 defeat to Croatia. Brazil opened with a 3-1 win over the Croats before being held to a 0-0 draw by Mexico. The Africans will be without defensive midfielder Alex Song, who was red-carded against Croatia, and it remains unclear if striker Samuel Eto’o, the team’s best and most experienced player, will recover from a right knee injury. Brazil coach Luiz Felipe Scolari will be able to count on striker Hulk, who wasn’t fully fit for the match against Mexico because of a left leg injury. Scolari has said he was considering making changes to the lineup after the draw against Mexico, but in practice on Saturday he used the same team that started the World Cup, with Hulk in attack. Brazil has four players going into the match with a yellow card, including Neymar and captain Thiago Silva. Another yellow against Cameroon would rule them out of the round of 16, when Brazil would face either South American rival Chile or the Netherlands, its nemesis from the quarterfinals of the 2010 World Cup in South Africa.